Submitted by Alexander Briones on Dec. 18, 2015. This article will help you understand what the main kinds of microphones are that are used in music production, both live and recording, and what each type of mic is typically used for. Polar patterns describe how microphones pick up sound, showing specifically where mics 'listen' spatially and which positions are blocked. Having a good grasp of these polar patterns will help you select the right mics that capture the sound that you need while minimizing unwanted noise. Cardioid mics capture everything in front and block everything else. This front-focused pattern will let you point the mic to a sound source and isolate it from unwanted ambient sound, making it ideal for live performance and other situations where noise reduction and feedback suppression are needed. Cardioid mics surpass other polar patterns by far in terms of popularity, used widely in live performances, from karaoke to big arena concerts. Other common uses include miking loud instruments like drum kits and guitar speakers. Note that these types of mics add subtle sound coloration when the source is off axis, which is why mic position when speaking and singing is very important. These mics have the same front directionality, but have a narrower area of sensitivity compared to cardioids. This results in improved isolation and higher resistance to feedback. Because of their enhanced ability to reject noise, you can use these for loud sound sources, noisy stage environments or even for untreated recording rooms. On the flip side, back rejection is a bit compromised, so you will have to position unwanted sounds like stage monitors and drum kits on the dead spot sides. These are microphones that capture sound from all angles. Because of their non-directional design and zero rejection, these mics capture nuances better, resulting in a more natural sound. You can use these mics in studios and other venues (like old churches) with great acoustics, and can also be used for live recording of multiple instruments, as long as the noise level is low. The obvious downside is that they lack background noise rejection and are prone to monitor feedback, which makes them unsuitable for loud and noisy venues. The name of this pattern is derived from its graphical representation, which looks like the number 8. The long and short of it is that Figure-8 mics capture the sound of both the front and back, while rejecting the two sides. This front and back sensitivity makes them idea for stereo recording and for capturing two or more instruments. They are essentially like omni directional mics, but with sound rejection on two sides. Although not as popular as other polar patterns, the figure-8 is commonly used on ribbon mics and on some large diaphragm condenser microphones. Shotgun mics, also called Line and Gradient, feature a tube like design that make their polar pattern even more directional than hyper cardioids. The capsule is placed at the end of an interference tube, which eliminates sound from the sides via phase cancellation. This design results in a tighter polar pattern up front with longer pickup range. Although Shotgun mics are more commonly used for film and theatre, they also make great overhead mics for capturing things like singing groups, chorals, drum cymbals. . These are microphones that can change between different polar patterns, allowing for versatile placement. Many of today's USB condenser microphones have this feature, letting you switch between multiple patterns by simply flicking a switch. Others provide the same flexibility through changing the mic head. The advantage that these mics offer is obvious, more positioning possibilities and more usage. Just remember to be careful when handling these mics, you don't want to accidentally damage the extra moving parts and circuitry that give them their versatility. Microphones pick up sounds through their diaphragm, a thin material that vibrates when it comes into contact with sound. This vibration converts sonic energy into electrical energy. While there is no actual standard unit of measurement, there are currently three main classifications for mic diaphragms, all of which are referring to the diaphragm's mass. The size of the diaphragm affects the microphone's sound pressure level handling, sensitivity, dynamic range and internal noise level. Mics with small diaphragms are commonly called pencil mics because of their thin cylindrical shapes. Their compact design makes them lighter and easier to position, and interestingly, they are designed to be stiffer, to handle higher sound pressure levels and have wider dynamic range. You can use them on acoustic guitars, hi-hats, cymbals, and other instruments. Known limitations of this particular diaphragm type are increased internal noise, and low sensitivity. The bigger the diaphragm, the more it can sense air vibrations, and the more vibrations are captured, more of the sonic details are faithfully reproduced. Unlike small diaphragms that are stiff, large diaphragms move easily, allowing them to detect even faint differences in sound pressure levels which result in a more transparent and natural sound. This affinity to fidelity has made large diaphragm mics a staple in recording studios, and they are now the most common configuration used on modern USB mics. You can use them to record just about anything, from vocals to guitars and other instruments, just make sure that you keep the volume in check because they can distort when the sound pressure level is increased. Medium Diaphragm mics are sometimes called hybrid because they combine the characteristics of small and large diaphragms. They tend to have a slightly fuller and warm sound similar to large diaphragms while retaining some of the high frequency content that small diaphragms could. These are modern microphones that are gaining reputation in both live and recording situations, but essentially, you can skip on these mics if you're setting up a small home studio or a small venue, especially if you already have large and small diaphragm mics to work with. Here are the three types of microphones most commonly used in music, available with either XLR or USB connectivity. Note that USB powered versions don't require phantom power. If you're looking for something reliable and versatile, then you ought to start with dynamic mics. Thanks to their moving coil magnetic diaphragm, these mics reliably capture sound and can do so even at high sound pressure levels. As such, you can use them for miking loud sound sources like bass and guitar amplifiers, and even drum kits without worrying about unwanted distortion or damage. Finally, they are not just for high SPL (Sound Pressure Level) applications because they work quite well in quieter settings. 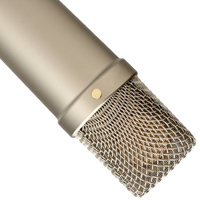 Condenser mics have a thin conductive diaphragm that sits close to a metal backplate. This configuration works like a capacitor wherein sound pressure vibrates the diaphragm which in turn changes the capacitance to produce the audio signal. Since they use capacitance instead of actual moving coils, fidelity and sound quality is improved, making these mics ideal for precision recording in the studio. Note that this method of sound capture requires power, so you'll need a mixer or direct box with phantom power (except in cases where batteries are used). Whatever instrument you are trying to record, condenser mics will get the job done so long as the sound pressure levels aren't too high. Just remember to handle them with care as they are not as sturdy as dynamic mics. While these mics are no longer as popular, Ribbon mics were once very successful particularly in the radio industry. The light metal ribbon used in these mics allows it to pickup the velocity of the air and not just air displacement. This allows for improved sensitive to higher frequencies, capturing higher notes without the harshness while retaining a warm vintage voicing. These days, interest for Ribbon mics have returned, especially since modern production ribbon mics are now sturdier and more reliable than their old counterparts, making them viable for live multi-instrument recording on venues where noise level is manageable. You can also use them for recording if you're looking for vintage vibe, or you can set it up in combination with dynamic or condenser mics for a more open sounding track. Here we look at the main purpose each kind of microphone is typically used for. This is a good guide to get you started and once you gain experience with each mic type you'll find additional applications that work for you. For live vocal performances where stage volume can get loud and feedback suppression is important, the best choice is to use cardioid mics - see our guide to the best microphones for singing live. Recording vocals on the other hand is a different undertaking that requires more attention to the singer's nuances, as such large diaphragm condensers work best. If you are going for a more vintage sounding vocal recording, use ribbon mics or go for good old dynamic mics instead. In addition, small diaphragm omnidirectional mics and shotgun mics can be used for capturing choirs and singing groups, and are especially useful when choirs perform in venues with great acoustics, like churches. Because acoustic drum kits are naturally loud and punchy, you'll want to go with dynamic cardioid mics for the snare, bass and toms. Small diaphragm microphones can then be used to capture the nuances of the hi-hat, ride and cymbals. For best results, there are specialized mics that are fine tuned to handle the different frequencies and SPLs of each part of a drum kit, you can either get them one by one or go for convenient drum kit mic bundles. In the studio, you can setup an Omnidirection or ribbon mic to blend in some ambience into your drum tracks. Close mic'd guitar amplifiers are as loud, sometimes louder than drum kits, and as such they require mics that can handle high SPL. Your best bet is a cardioid or hyper cardioid dynamic mic that is well positioned in front of the amp speaker. Again a second condenser mic or ribbon mic, set back at a distance, can be used in case you are using multiple amps or if you want a warmer more classic sounding output, or in combination with a close mic to capture some of the room ambience. Acoustic guitars when not amplified have a softer sound with immersive nuances. These type of instruments require the fidelity and quality of large diaphragm condenser mics. You can also go for a well placed Cardioid condenser mic or Figure-8 pattern ribbons depending on the situation and noise level. Finally, setting up an extra small diaphragm mic will work wonders in capturing the higher frequencies that sometimes get lost when acoustics are plugged in or miked directly up front. We've talked about the main types of microphones you'll use in various situations, however as you gain experience you'll also learn how to break with convention. If there's anything more you would like to know about microphones then please feel free to ask in the comments below. Submitted by Marney (not verified) on Dec. 19, 2015. Which type of microphone is best for making podcasts? Submitted by Jason Horton on Dec. 19, 2015. For recording podcasts indoors then a Condenser Mic is the best way to go. You can get a USB one so that you don't need an audio interface - just plug it directly into your computer or tablet. If you're recording outside, such as interviewing people in public places, then it's generally best to go with a Dynamic Mic which can take the punishment of being carried around in bags and knocked a few times - you can find these in our Live Vocal Mic Guide. Submitted by Jason Horton on Jul. 15, 2016. UPDATE: We now have a guide specifically about USB microphones for Recording & Podcasting. Submitted by profroshdy@gmail.com (not verified) on Oct. 11, 2018. Submitted by Jason Horton on Oct. 15, 2018. We don't send out lists, but the list you're asking for is available in our guide to The Best USB Microphones. Submitted by Eugene (not verified) on May. 12, 2016. I do a lot of narrating for official functions and events and I am looking to purchase my own personal mic. What type of mic is the best for public speaking? recommend a condenser, what can I use to provide phantom power if the sound system they are using does not inherently have the capability to produce it? I am looking for professional quality mic that I can take from event to event with me. I would be grateful for any recommendations or suggestions. Submitted by Jason Horton on May. 12, 2016. A dynamic mic is definitely a better option for public speaking because they are more robust, simpler to operate and generally less expensive than condenser mics. I would recommend the Shure SM58 or the wireless version Shure SLX24/SM58. Submitted by REJI JACOB (not verified) on Jul. 14, 2016. I want to know whether a microphone can be connected to the subwoofer of a home theatre System for homely uses ? We don't provide advice on home theater systems - we try to stick with the gear we understand at the pro audio end of the spectrum. That said, it's quite an unusual idea you have there. If you can tell us exactly what it is your are trying to achieve then we may be able to steer you in the right direction. Submitted by Sarah Burrows (not verified) on May. 5, 2017. Submitted by Jason Horton on May. 5, 2017. Submitted by Amy (not verified) on Jul. 20, 2016. I need a mic for my class room, occasionally, to make my voice loud enough. So what kind of mic do I need? Thanks. Submitted by Jason Horton on Jul. 20, 2016. In a classroom setting you need your hands free so the type of mic you're looking for is known variously as a Lapel or Lavalier microphone - and you'll want a wireless system. These aren't typically used in music production so we don't have any specific guides on this website, however here is an old one at B&H that might help you. Submitted by RB (not verified) on Aug. 17, 2016. I need a good mic for voice-over work. I bought a USB mic but was having issues with a "hiss". All attempts to get rid of it have been futile. So I've decided to get a new mic with an audio interface. I can't decide between a large or medium diaphram. A friend recommended the Scarlett Studio USB Recording Package (1st Gen). A little help please! Submitted by Alexander Briones on Aug. 18, 2016. USB Mics are more convenient and easy to setup making them ideal for voice-over work. But since you mentioned you were getting unwanted "hiss", have you tried moving to another spot in the house to rule out interference? Also have you tried at least two USB mics to rule out quality issues? I recommend giving USB mics another try, given the success that many are having with them. We have a gear guide that specifically discuses top rated USB mics if you want more information. If your friend is specifically recommending the Scarlett Studio 2i2 Bundle, and you've decided to switch to an audio-interface setup, then I concur. Focusrite is well known for their home/mobile audio interfaces, and the Scarlett 2i2 is highly rated, so it's an easy recommendation. Thanks so much for the help. Submitted by Anonymous (not verified) on Aug. 23, 2016. Thanks so much for the help. I have tried recording in many different locations including the sound proof recording studio at the radio station I work at. Still got the hiss. Unfortunately, I don't have another USB mic. Thanks for the link. Most of them are "dream mics"! But I'm a little tight with budget for now. Hence, I'm opting for the Scarlett Studio 2i2 as it comes in a package which seems more cost effective. Once again, many thanks for the help! It is much appreciated! Submitted by Kay Abbey (not verified) on Aug. 22, 2016. What mics are appropriate for vocals and instrumentation when you want to have a live recording of a concert? Submitted by Alexander Briones on Aug. 23, 2016. Many have had success with the industry standard Shure SM57 for capturing both vocals and instruments in live situations, and it is the easiest to recommend for those who are starting out. Note that there are other instrument and vocal specific mics which can give you better results, but this will depend on the instruments that you're going to capture, the quality of the sound you want, and your budget. Submitted by mark (not verified) on Jan. 17, 2018. Hi wanted to ask the best mics for studio broadcasting. Submitted by sir Mike (not verified) on Aug. 25, 2016. What mic is best for television stations and radio? Submitted by Jason Horton on Sep. 13, 2016. This question is a bit too broad to answer with confidence, but assuming you are talking specifically about mics for on air announcers then you'll want something that has a cardioid pickup pattern to reject any sounds that don't come from directly in front. We don't provide any guides to professional TV or radio studio mics, but if you have a small setup then you might find our guide to USB mics for Recording & Podcasting useful. Submitted by Ajibola Bamidele (not verified) on Aug. 27, 2016. I am a public speaker and require a microphone that will be suspended on my lapel or tie and produce maximum quality as i move round a hall seating 1000 people. You need a Wireless Lavalier Mic system for that. These range in price from $100 to $1000 with an entry level system being one like the PylePro PDWM3400 and higher up the scale there are systems like the Sennheiser EW 100 ENG G3-A. Submitted by Arthur Kaletzky (not verified) on Sep. 13, 2016. Only vocal, drums and guitar recommendations?? The world isn't only rock-n-roll! Please write something about [acoustic] piano and wind instrument mics, I'd be really interested to read that. At the moment we are primarily focused on producing guides for rock/pop/folk/electronic music because that's what most of our readers want. I'll add your suggestion to the list of microphone topics we will consider, but we already have several other mic topics on our publishing calendar that we'll cover first. In the meantime you might find this guide from Sound on Sound very helpful for selecting and using mics on acoustic piano. Submitted by Anonymous (not verified) on Oct. 6, 2016. I play Congas/Bongos in a loud environment. My dynamic mics are picking up other instruments and crowd noise. Which mics are best at isolating just what's in front of them? I've heard some folks say SM57 or Beta 57a, but I'm not clear as to which cardoid type is best for me. Submitted by Natalia Catlett (not verified) on Nov. 5, 2016. I direct a group of theatre students who meet in a church. When the students are directly behind their microphones the sound is great. Or when using a lapel mic. I want to have a more fluid wash of sound. The stage is a hollow floor, too, so we have to be careful for footstep noise. I am thinking a ribbon, but not sure. What do you think? Thanks in advance. Submitted by Jason Horton on Dec. 30, 2016. Ribbon mics are generally used for recording. For the theater you usually use wireless lapel mics for the leads and overheads for the chorus. Submitted by Anonymous (not verified) on Dec. 30, 2016. I've been miking a classical guitar in a jazz combo with a Shure dynamic mic, but I've heard that condensers might be better for guitar. I'm having trouble being heard over the other musicians. Will the condenser give me increased volume? Or is it too sensitive? I'm either too quiet, or I have feedback issues. Condenser mics are generally preferred for classical guitar, however that's mainly due to their frequency response and resulting tone rather than volume. The best way to combat feedback issues is either with an acoustic preamp or specialized acoustic amps which have feedback detection or suppression systems. Submitted by Luke (not verified) on Mar. 3, 2017. I'm in a situation where I need to record EDM coming from a speaker using a Mic. What microphone works good for this? Submitted by Jason Horton on Mar. 3, 2017. I would say don't do it that way - you will get much better results taking a line out from the source rather thank miking speakers. Is there any particular reason why you have to use a mic? Submitted by Beth (not verified) on Mar. 21, 2017. Hi. I'm a female vocalist in worship band looking for a mic which carries high end and captures bell like soft moments but also gutsy texture range is d below middle c 2 octaves. Good pitch. Problems sometimes with cutting through the mix . Smooth mellow sound vocal. Suggestions? Submitted by Jason Horton on Mar. 21, 2017. If it's a live vocal mic you're looking for then be sure to also read the comments section of that guide because you may find the answers there to be quite helpful. I would check with the school to see what they recommend - they might also have group buying discounts organized with a particular seller. Submitted by soumya singh (not verified) on May. 7, 2017. Which type of mics we should use for singing? Submitted by Jason Horton on May. 9, 2017. If you want a mic for recording then check out our guide: The Best Studio Mics For Vocals. If it's live performance you want one for then look at the guide: The Best Live Vocal Mics. Submitted by Dorine (not verified) on Aug. 20, 2017. I am taking singing lessons and setting up a small home studio along with a professional karaoke machine. I need a microphone that I can practice on and can take the abuse of the use of the karaoke machine. What microphone do you suggest? Submitted by Alexander Briones on Aug. 22, 2017. Instead of giving you one mic recommendation, I'll point you to our 2017 updated list of the best live vocal microphones, you can check them out to see which ones fit your budget and singing style. Submitted by ARIKA DAVID (not verified) on Sep. 18, 2017. Small diaphragm mics are the best in podcasting since they are stifle, small and easy to adjust. Personally I have carried investigation upon it and I recommend them. Submitted by Steve Leonard (not verified) on Nov. 11, 2017. I play acoustic guitar (nylon strings)and sing unplugged in aged care homes. I want to boost my volume using just one mic for both voice and guitar preferably placed about two feet in front of me (on music stand). I would plug it into a Vox mini amp (mic input). What sort of mic should I use? Submitted by Jason Horton on Nov. 12, 2017. The Vox Mini amps don't provide phantom power for the mic so you'll need to get a dynamic mic. They also only have a 1/4" input jack so you'll have to get a mic with a 1/4" plug on the end of its cable, or get an XLR to TRS adapter plug if you get a mic with an XLR connector. Submitted by Steve (not verified) on Nov. 12, 2017. Thanks Jason. I already have a dynamic mic but it can only work up close to either my voice or the instrument but not both. So are you suggesting that (if I had phantom power) a condenser would be better in my situation than a dynamic? What about a condenser with its own battery power? Submitted by Jason Horton on Nov. 13, 2017. It seems like the core of your problem isn't really with microphones, it's that you're trying to use an amplifier in a way it was never really meant to be used. What you need is an amp that has separate channels so you can mix the signal between the guitar and vocals - this requires either 2 mics or 1 mic and pickups on your acoustic guitar. There are some excellent acoustic amps designed exactly for this purpose, and some like the Roland AC-33 are also battery powered like your Vox Mini. Check out our guide to The Best Acoustic Guitar Amps. Submitted by Steve (not verified) on Nov. 13, 2017. Submitted by T SUMAN (not verified) on Nov. 22, 2017. What type of microphone is used for recording sound from ac's and UPS's and the noise obtained from other electronic devices? Submitted by Jason Horton on Nov. 22, 2017. That's not a topic we cover here, maybe one of our readers will have an answer for you. Submitted by Gary V (not verified) on Jan. 3, 2018. I need a microphone that can be used at a podium, but does not require the speaker to be up-close and personal with it. I need it to pick up sound from 2 to maybe 3 feet away without having to directly focus at it. Got any suggestions? Submitted by Juan (not verified) on Jan. 10, 2018. Hi! I was wondering what do you mean by "large diaphragms move easily". Small diaphragms, in general, have faster transient response because they have less mass, which would mean that small diaphragms move easily. However, I don't know if what you're trying to say is that larger/heavier diaphragms tend to move easily in terms of displacement, which makes them more sensitive, but still have a slower reaction to changes compared to small diaphragm mics. Thank you very much, in advance, for your reply.